Since technology is constantly evolving and transforming, new skills and abilities are continuously required to fill new positions. With the IT industry having such a huge focus on skills, it’s important to stay a step ahead and expand your own skill set. There are many resources available both online and in person to do this, and the summer is a great time to get started. When you give yourself time to upskill, you can give your career the boost that it needs and help yourself to stand out to potential employers. The festive season is a great time to take new skills on board in your spare time, or at work. So we’ve put together a simple guide to upskill yourself for the New Year and beyond. In our previous blog, we mentioned that evaluating your career can give you the opportunity to assess your overall career and goals. Secondly, when you’re able to reflect on what you enjoy, or don’t enjoy in your job, it can help you see whether a change is needed within your career or not. You might be interested to look for a new job, work within a new industry, or simply stay put in your current role. Either way, reviewing your career can help to give you a clearer picture of how you’ve performed, whether you’ve reached your goals, and if you need to improve on anything. If you’re looking to upskill, knowing where you stand in your career can give you a better idea of what you might want to pursue and learn, and how that might benefit you. There are various ways to stay productive over summer if you’re looking to pick up new skills. Whether you have a thirst for more knowledge, or you want to get involved with online tech communities, here are our four top ways to upskill yourself. In your spare time, tutorials can be a great way to learn new information and expand your knowledge. Tutorials can be found both in-person and online. In-person workshops are a great solution if you’re looking for a more social learning environment, or alternatively, if you’re short on time, online tutorials can be more convenient for your schedule. With so many online learning platforms out there, it can be hard to pick just one, but the great thing is that you don’t have to. As well as the aforementioned Codeacademy and Laracasts, some notable names include, Coursera, Udemy, and O’Reilly Media, which hosts a range of downloadable technology books, magazines, research, and tech conferences. On the other hand, if you enjoy watching speakers present short, powerful talks, TED Talks is another great platform. This list of the Top 10 TED Talks for Techies is a huge hit among tech enthusiasts, touching on everything from bionics to big data. Although finding great tutorials is a great way to help you expand your knowledge and skill set, putting those skills to the test by getting involved in the community is another way to sharpen your expertise. Open Source, GitHub and Stackoverflow are all big platforms that encourage collaboration between developers, users, and organisations. These platforms give you the freedom to work on your own projects, share your current assignments, and to work alongside talented and like-minded individuals who are passionate about technology. As well as enabling you to give back to the community by opening up your own work to new ideas, you’ll often find yourself stumbling across innovative solutions that you can bring with you into your own career. Whether one of your New Year’s resolutions is to find a job, or if you’re an experienced professional simply interested in gaining more knowledge about your industry, networking can connect you with valuable opportunities. With that said, it’s near impossible to attend every networking event. Instead, think of which events cater to your specific needs and career goals. Once you’ve determined the events that seem worthwhile to you, note them down in your calendar. Over the summer period there are many networking opportunities in Christchurch. Our previous blog highlights some of the local technology events and workshops, including the annual Canterbury Tech Summit. Canterbury Tech NZ also has a number of monthly Meetup groups around the Christchurch and Canterbury areas. There are also a number of national events that attract crowds each year which are worth keeping an eye out for. Another way to improve your network is to find a mentor within your industry. Our Mentor Connection Programme connects talented IT professionals with skilled and experienced people. These mentors are able to provide guidance, expertise, and knowledge to people that are looking to advance their careers. If you’d like to find out more about getting involved as either a mentee or mentor, please get in touch with us at Sourced. Generally, the skills needed for IT continue to change due to new demands and new roles constantly cropping up in what is a very dynamic sector. Staying informed of what employers want is more important than ever, and can be hugely beneficial for your job search. So, what skills are needed for you to land your dream job? 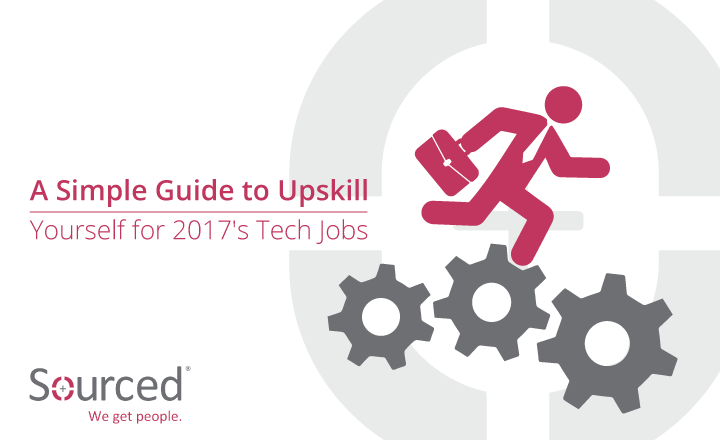 We took a look at four crucial soft skills for technology professionals in our previous blog, and this global survey focused on the most in demand tech skills that can get you hired in 2017. By keeping these in mind when you’re looking to expand your skillset, you’ll give yourself options if and when you look to move on. Learning new skills over the festive season doesn’t have to be a chore. There are proactive and engaging ways to get involved with the community, build your network, and grow your skillset. Using the festive season to upskill yourself can be beneficial to your career and your own personal development. Find something that works for you and, most importantly, something that you enjoy! For more resources or advice on how to upskill yourself and boost your career, don’t hesitate; check out our blog, get in touch today.